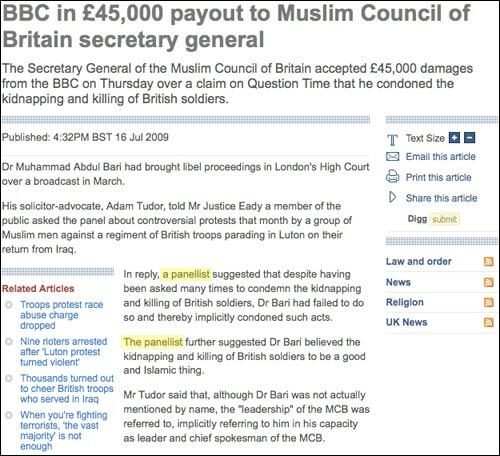 It was No Rock And Roll Fun who I saw pointing out that The Telegraph had reported on the BBC's £45,000 payout to the Muslim Council of Britain, all the time referring to an anonymous 'panelist' who had made the libelous statements on Question Time. Most other media outlets mentioned that the mysterious 'panelist' was Charles Moore. They also seemed to think the fact that he is a columnist for, and ex-editor of, The Telegraph was a significant element in the story. And several other British media outlets mentioned that he has been waging a campaign against the BBC's Licence fee funding, including an article he wrote just a few days ago for The Telegraph entitled "Dear BBC: No, you can’t have my £142.50. Will I see you in court?". Which only serves to make the omission even more glaring. This behaviour isn't in any way exclusive to The Telegraph. It would be very easy to leave a comment under this blog post and say to me that "Martin, you used to work at the BBC, and where is their comprehensive coverage of the struggle to get the Balen Report released?" or "You are working at The Guardian, and I can point to some of their articles about Tesco or tax documents from Barclays which are somewhat scant in their details". Which is why I see this particular example as a symptom of an industry wide issue. The media have decried an era of spin under a 'Nu Liebour' Government. We universally leap to condemn a culture where spin doctor media management leads to there being 'a good day to bury bad news'. Yet when the bad news is about our own industry, our industry employs similar tactics. And just as politicians are being found out by 'new media', so are we. These are tactics that belong to an analogue era. 15 years ago, you could publish an article about a mysterious 'panelist', and pretty much rely on the fact that only a very small proportion of your readers would have been intrigued enough to do further research. Even if they did, their options were pretty limited. Maybe they'd go to the local library to look up some newspaper back issues. Or phone or write to the BBC or the newspaper editor and hope to get some clarification. Or maybe they'd be very pro-active, and buy another newspaper title to see if they had more detail on the story. I'd wager that the number of Telegraph readers who wanted to find out who the mystery panelist was and who didn't have access to an internet search engine was tiny. For the majority, if they were engaged enough to do their own bit of research on the name of the panelist who had just cost the hard-pressed Licence Fee payer £45,000, they'd end up thinking that the paper they had just paid money for had treated them like a bit of a mug. With the impact of digital distribution, and the effect of the economic downturn, we have more than enough reasons to think that the news industry is dying. Treating our remaining paying customers like children who haven't learnt to use Google yet makes us look like we have a collective death wish. By Martin Belam on 18 July 2009. I don't understand. Why don't the BBC simply take the cost of Charles Moore's licence fee out of his next appearance fee (it would be nice if they took £45k out as well but that may be asking too much)? I seem to recall all those council tax martyrs getting terribly agitated when people paid their tax bill on their behalf. It would be interesting to see what colour Moore would go. Purely in the interests of research you understand.